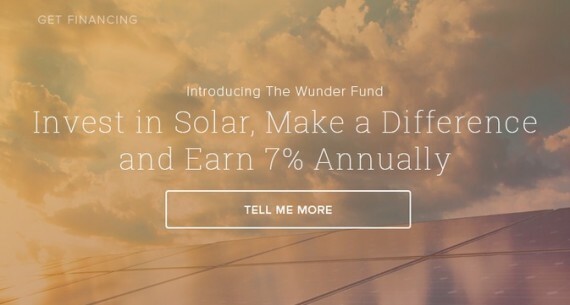 Wunder is a new solar power investment platform for individuals. Bryan Birsic, co-founder and CEO generously answered some questions about his startup and what benefits it can provide to investors. How does Wunder find the best solar investment opportunities? We have built a network of more than 50 top-tier solar installer partners across the US. Since our focus is on the 20kW-500kW “underserved middle” of the market, these installers often have a backlog of qualified projects in need of financing. Typically, these projects have gone unfinanced due to the complicated and costly nature of project evaluation. In the past, doing proper diligence on smaller projects has not been possible because the costs associated with such an evaluation break the economics. Once we receive a new project, we run it through our automated and proprietary diligence software. Projects are evaluated on every dimension, from the macro-scale energy economics down to technical details that might affect the output of the array over the long term. This is all in an effort to identify projects that will deliver strong returns to our investors while also delivering great value to the energy customer. Since our partners have found Wunder easier to work with than traditional capital sources, and because we can finance a much larger percentage of proposed projects, we’re now beginning to also get first-looks at our partners’ new deal flows. Does Wunder communicate with the actual solar power developers that are responsible for constructing the projects and tell them they have funding through the platform and who the funding is from? The same installer partners that source us projects for financing also perform the construction. We’ve gone to great lengths to build close relationships with our installer partners, providing transparency into our financing process. This communication is critical for us to operate most efficiently with our partners, and bring the best projects to our investors. We perform an initial assessment that informs us about the viability of the project. This helps our installer partners quickly identify which projects are financeable, and which they should drop (thereby saving sales and design resources). If a project checks out, we work with our partners to complete our diligence and ready the project for investment. Our installer partners understand that our capital is sourced from the crowd, as well as from institutional and corporate investors. In certain cases, they’re made aware of major anchor investors, but, by and large, they’re not provided full detail of our capital sources. How many solar projects can an investor fund through the system? We anticipate bringing 50-100 projects to our investors in 2015. Does the system show interest rates for each solar project? Every project financed by Wunder’s first fund will deliver a 7% annual return to our investors with a high degree of certainty. We are launching additional funds in 2015, which may have different return profiles. Does the system estimate risk for each investment? Wunder’s diligence approach brings a fundamentals-based risk analysis to each project. We provide investors not only the outcomes of this process, but insight into our risk assessment process, enabling them to evaluate the key project risk factors for themselves. Is the investor supposed to do her or his own due diligence when researching the solar power developers that are featured within the system or does the system also provide background information about them? Along with details about each project, we provide investors with background information about the installers who are building the system. We are only working with a select group of installers currently who are regional leaders that have been thoroughly vetted by our team. Over time, the platform will open up to a broader range of installers. How many investors have signed up for the platform so far, and how many solar projects have your investors helped fund as well? The platform just launched on October 9th and investors have already reserved well over $500k of a planned $1M in initial funding. We have not yet begun calling that capital but investors with reservations in the fund will be the first to see the best opportunities we’ve culled from more than $60M in projects we’ve received to date. What are some of the overall goals for the system, in terms of number of smaller solar projects you want to fund and return on investment for the funders? We believe that there is a huge opportunity to deploy new and more flexible capital into the commercial solar market. As we have seen over the past few years, access to capital has driven rapid growth within the residential sector, and we believe that bringing capital into the commercial market will have the same effect. As a company our objective is to help open up the commercial market to new development and facilitate the deployment of gigawatts of new solar capacity. Our goal is to fund tens of thousands of projects, and deliver a return to every accredited investor that matches those that institutions have captured in this market for years.